Zoey Deutch is an American actress who played Juliet Martin in The CW television series Ringer from 2011 to 2012. She is also known for roles such as Rosemarie “Rose” Hathaway in Vampire Academy, Maya Bennett in The Suite Life on Deck, Beverly in the Richard Linklater film Everybody Wants Some! !, Samantha Kingston in Before I Fall, Stephanie Fleming in Why Him?, and Erica Vandross in Flower. Her other notable film works include Beautiful Creatures, Good Kids, Dirty Grandpa, and Set It Up. 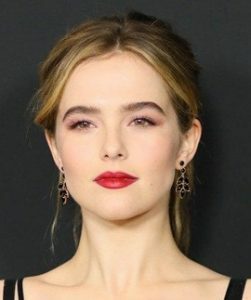 Born Zoey Francis Thompson Deutch on November 10, 1994 in Los Angeles, California, USA, she is the daughter of actress Lea Thompson and director Howard Deutch. Her older sister, Madelyn Deutch, is also an actress. She is of Russian Jewish and Polish Jewish descent on her father’s side, and of Irish, English, Scots-Irish, German, and distant Dutch descent on her mother’s side. She studied at Oakwood School, followed by The Los Angeles County High School for the Arts, where she majored in Theatre. She was in a relationship with actor Avan Jogia from 2011 to 2016. In 2018, she began dating Dylan Hayes. *She was born on November 10, 1994 in Los Angeles, California, USA. *She is the daughter of Lea Thompson. *She was raised with many pets around the house, including 6 dogs, a cat, an African Grey parrot, several horses, and a pond full of koi fish. *She began taking acting classes at the age of five.